Cloning a fruit tree is as basic as taking a stem cutting from the parent tree for propagation. This makes each plant taken from the parent pear tree identical. 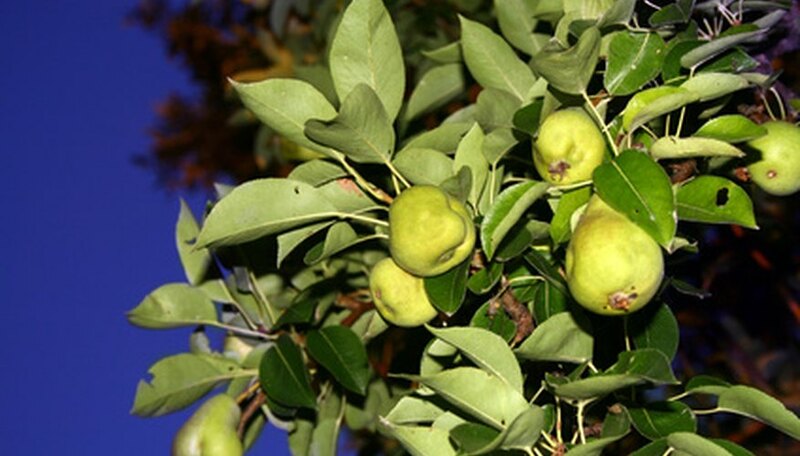 Stem cuttings from the parent pear tree are taken in late spring to early summer from the new green shoots. This method of propagation is an economical means of expanding a home fruit orchard for the yard and landscape. Mix equal parts of peat moss and clean sand. Fill a 6-inch pot to within 1 inch of the top rim with the soil medium. Add 1 qt. of water to the rooting soil medium. Pour the water slowly so all of the water enters the soil medium. Allow all excess water to drain from the lower holes. Select from the parent pear tree a new year's growth, a shoot that is vibrant green on the stem. Cut the stem so the overall length is approximately 8 inches. Remove the lower 2 inches of leaves near the cut end. Dip the cut end into rooting hormone. Insert up to six cuttings 2 inches into the soil medium of 6-inch pots. Space the cuttings evenly in the pot. Cover the stem cuttings with a large piece of plastic food wrap to act as a mini-greenhouse and retain moisture. Set the pot with the stem cuttings on a bright windowsill out of direct sunlight. Check the soil for moisture content after two weeks. Remove the plastic cover. Press your finger into the soil. Add 1 cup of water if the medium is dry. Inspect the soil for moisture content every two weeks. Pull on the tops of the stem cuttings after three months. Slight resistance indicates the formation of a root system. Remove one seedling from the pot. Inspect the roots. Transplant roots greater than 1 inch in length into separate pots using a soil mix of equal parts peat moss and sand. Transplant the individual pear seedlings to a permanent location the next spring. Keep all new cuttings from direct sunlight exposure. Direct sunlight can over heat the new cuttings and cause them to prematurely dry out.